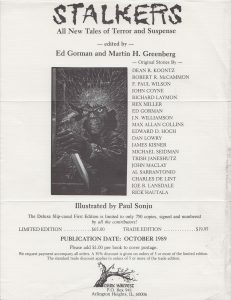 “Trapped” Copyright ©1989 Nkui, Inc.
750 signed and numbered copies with slipcase, signed by all contributors. 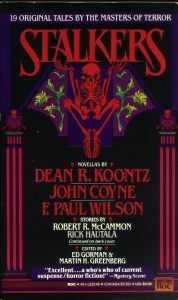 This edition is the same as trade hardcover but with the addition of two signature pages in the front. "Trapped," copyright © 1989 Nkui, Inc. Publisher: ROC, an Imprint of New American Library, a division of Penguin Books USA Inc.
“Trapped” on one cassette, “Stalkers” by Ed Gorman on the other. Have a photo of this edition? 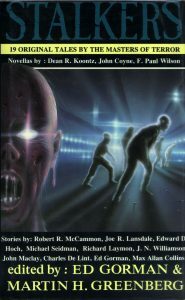 Contains same stories as the two-cassette version along with stories by Robert R. McCammon, Edward D. Hoch, Joe R. Lansdale & Dan Lowry, Charles deLint, Richard Laymon, and Trish Jane Shutz. Contains the contents of the four-cassette Stalkers along with abridged versions of Crystal Singer by Ann McCaffrey and The Druid of Shannara by Terry Brooks. Also includes: Lucky Day by Mary Higgins Clark read by Betsy Palmer, Pastime by Robert B. Parker read by David Dukes, Snagged by Carol Higgins Clark read by the author and Dealer’s Choice by Sara Paretsky read by Elliot Gould. Copyright: Copyright © 1989 by Martin H. Greenberg & Ed Gorman, Inc. Copyright © 2007 vy Phoenix Audio, Inc. I have an outstanding question about a story that was going to be included in Stalkers but wasn’t. Check it out in this post and let me know if you can assist.